So, I am kind of lying when I call this my “current breakfast obsession.” Because, truth be told, I’ve only eaten it twice. Twice this year, that is. And that’s because this breakfast involves pomegranate and those fuchsia beauties just showed up in my grocery store last week. Whether that means pomegranate is actually in season or not is up for debate. But, I was obsessed with this breakfast around this time last year and now that poms are back, I’m sure to be obsessed again. So, this is kind of a breakfast obsession in advance. And I feel comfortable declaring this obsession-to-come because I’m pretty well versed in my own predictability. Oh, P.S. This is totally the wrong season for a cold breakfast, but there’s granola and maple syrup and a doughy texture that feels pretty comfort food-y so it totally works. The night before, I mix up 1/3 cup each of oats, plain Greek yogurt and milk (I use unsweetened almond) then cover the bowl and leave it in the fridge overnight. 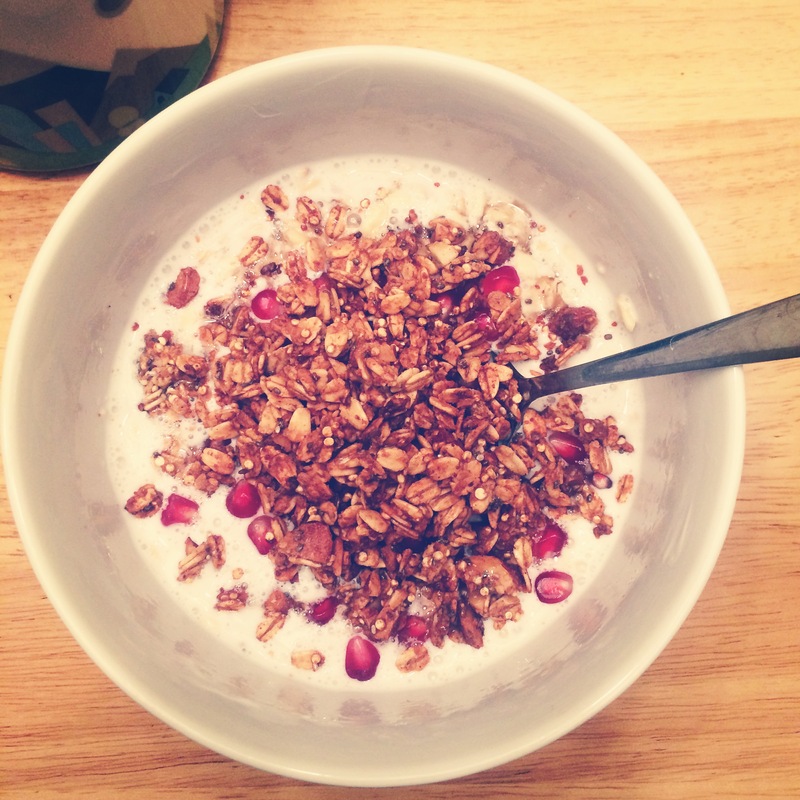 In the morning, mix then top with 1T maple syrup, 1/4 cup pomegranate arils and 1/4 cup granola (I just made this one and it’s incredible!). Then devour! This looks so yummy. Love pomegranate, I just hate buying the actual fruit, I prefer it all cut up. Looks so good! Nothing makes me happier than pomegranates! Not to mention how pretty they are!